Unless otherwise noted, all work contributed to this site or the project is copyright Sangoma Technologies. Any contributed material with assignment to the contrary violates the use policy of the site and will be removed. The removal of any copyright notices is strictly prohibited. By contributing comments, articles, images or other written work to the freepbx.org website, you grant Sangoma the right to use those works for any purpose in perpetuity. If an existing open source work is copied to this site, then it must be indicated at the top of the page. Sangoma Technologies (“Sangoma”) is the registered owner of the U.S. federally registered trademark FREEPBX (the “Trademark”), registration number 3365377. Subject to the terms and conditions of this policy (the “Policy”), Sangoma grants you a non-exclusive, non-transferable, royalty-free license to use the Trademark in reference to the software distributed through FreePBX.org in its original form. Sangoma recognizes the importance of the open source community and hopes that you will download and use the software distributed through FreePBX.org, and that you will modify, improve, enhance and build upon that software under the licensing granted to you at the site. You should use the Trademark with the exact spelling and form used by Sangoma and at FreePBX.org. It should never include spaces or be abbreviated. However, you may choose to use the Trademark in all capital letters, or you may choose to use the Trademark in the form “FreePBX”. The trademark should never be incorporated into a logo or other image. Sangoma Technologies reserves the right to modify this Policy at any time, and may do so without prior notice. It is your responsibility to review this Policy occasionally, but at least on the 15th of each month following your first use of the Trademark, so that you are aware of any changes. If Sangoma makes any changes to this Policy, your continuing use of the Trademark is governed by the Policy as updated. Furthermore, Sangoma reserves the right to make special accommodations for particular users. In a situation where Sangoma authorizes use other than that described in this Policy, this Policy will not apply to you but some other document will be provided by Sangoma. By using the Trademark, you acknowledge that Sangoma has and shall retain all rights and remedies available to it, whether derived from this Policy, from statute or otherwise during the term of your use or thereafter, and may exercise those rights or remedies in the event you breach this Policy, misuse the Trademark or use the Trademark in any other way not expressly permitted by this Policy. You may not, either during the term of your use or after, do or cause to be done anything that challenges, contests, impairs or invalidates any of Sangoma Technologies rights in the Trademark. In any use of the Trademark, you should clearly attribute it to Sangoma Technologies somewhere on the page or document, as the trademark holder. 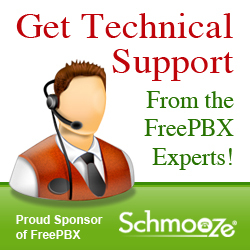 Acceptable example for this is "FreePBX® is a Registered Trademark of Sangoma Technologies". In each use, you must also indicate that the mark is federally registered by the U.S. Patent and Trademark Office, either by use of the “®” symbol (such as “FreePBX®”), by the phrase “Registered by the U.S. Patent and Trademark Office” or by use of other similar language. Where the mark is used multiple times in a single document, and repeated registration identification would be unduly burdensome or distracting, you may choose to note the registration in the first use of the trademark only. The Trademark should be used as required by any licenses through which you use, modify and/or distribute the software provided through FreePBX.org. The removal of any trademark notices from the FreePBX code or product is strictly prohibited. Sangoma reserves the right to revoke any and all permissions under this Policy at any time, in its sole discretion, by any type of notice. Upon notice that your use is detrimental, unacceptable, inconsistent with this policy or otherwise forbidden, you agree to immediately discontinue use of the Trademark. You may not use the Trademark in any way that suggests that you, your products or your services are in affiliated with or approved of by Sangoma. You may not use the Trademark for any commercial usage or in connection with any business that generates revenue by using the FreePBX Trademark unless your company has explicit permission from Sangoma Technologies. This Policy does not grant you the right to use the Trademark in a domain or other product, service or company name and does not grant you the right to use the Trademark in a webpage, in META tags, in TITLETAG or in any other similar way so as to influence search engine rankings or results. Use of the Trademark necessary to identify a product or service as compatible to the software distributed through FreePBX.org is acceptable, provided that it is unlikely to cause confusion over the product or service’s origin. Use of the Trademark to compete with FreePBX Core services such as Paid Support or other services that are sold or marketed on freepbx.org is prohibited unless approved in writing by Sangoma Technologies. Sangoma reserves the right to review any such use and object to such use if it causes confusion or otherwise violates this Policy. You may not use the Trademark in a way that will affect the high image, credibility, reputation of Sangoma or any software distributed through FreePBX.org. THE TRADEMARK IS PROVIDED “AS IS,” WITH NO WARRANTIES, EXPRESS OR IMPLIED, INCLUDING BUT NOT LIMITED TO, ANY WARRANTY OF NON-INFRINGEMENT. FreePBX is primarily released to the public under the GPL, however, some accompanying bundled software may be released under other licenses. Please see the source code for the exact licensing. FreePBX provides a module system to allow plugging in 3rd party modules into your FreePBX system. Any module that uses the FreePBX Module, Framework or GUI system must be released as GPL and use of the module must be for controlling or managing other GPL or open source software. Sangoma as the copyright holder does reserve the right to release modules that are not GPL and under a different license under a dual license model.